I can't think of many toys more perfect for Holly than the new Rainbow Dash Style & Groom by HTI. Both girls are very much into My Little Pony right now as there have been two recent DVD launches which helped them to rediscover their soft toys and My Little Pony models. 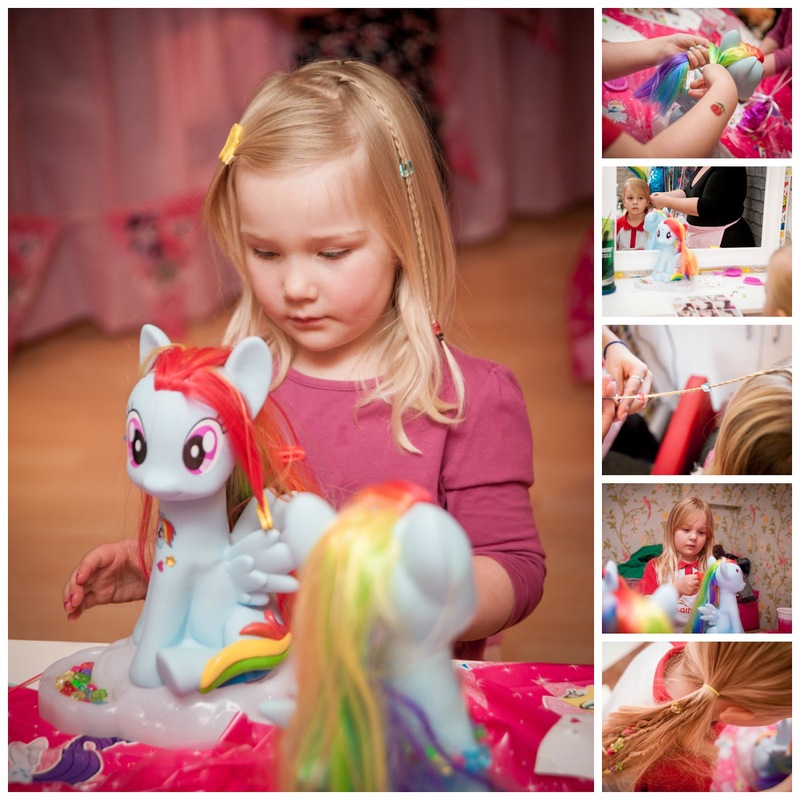 This Style and Groom Rainbow Dash is something a little bit special - a hair styling toy with clips, bands, beads and jewels that suits Holly - my little fashionista - down to a T. My girls got a very special chance to try out Rainbow Dash for themselves at Happy Faces salon in London where they were able to style their own My Little Pony and then have their style recreated for them on their own hair! I remember buying Lara a doll styling head when she was about Holly's age (3 and a half) so the age is absolutely perfect. But what makes Rainbow Dash stand out (apart from her brightly coloured rainbow mane) is the wide selection of accessories that she comes with. A hairbrush and hair bands is just the start. There is a big selection of beads which you can place in the hollows at the base of Rainbow Dash's cloud and then use the special tool to thread them onto the hair - both my girls were in awe when they learned how to do this. The set also includes stick-on jewels and tattoos that can be re-used a couple of times to decorate the pony all over. Finally, Rainbow Dash Style & Groom also provides a string of thread and a necklace charm which you can combine with the beads to make a necklace for your pony. My girls must have spent hours in the last week plaiting, beading and tying Rainbow Dash's hair. They both take it so seriously and concentrate sooooo hard when they are styling! Hair clips and new hairstyles are something Holly "plays" at nursery with her friends every day and so this toy had given her lots of new inspiration. The beads and stickers have all very quickly been distributed around our house; under the sofa, under the dining room table and even in the bathroom; I would look upon these smaller accessories as "consumables" and honestly, they fall out of the cloud base very easily so I've given the girls a little clip-top bowl to store them in now. 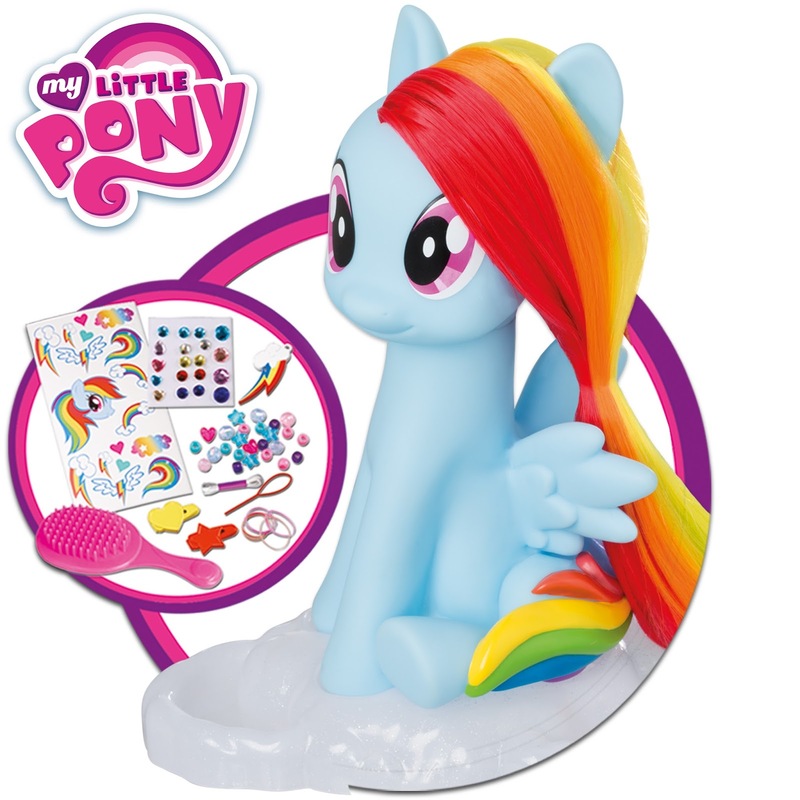 Compared to a number of other Christmas toys we have seen recently I was really very surprised to find out that Rainbow Dash Style & Groom is priced at a very reasonable £24.99. In terms of number of hours fun, I think this is really good value for money. Be warned though, you may spend the rest of your evenings trying to carefully remove hair elastics from multi-coloured pony hair upon your child's request. 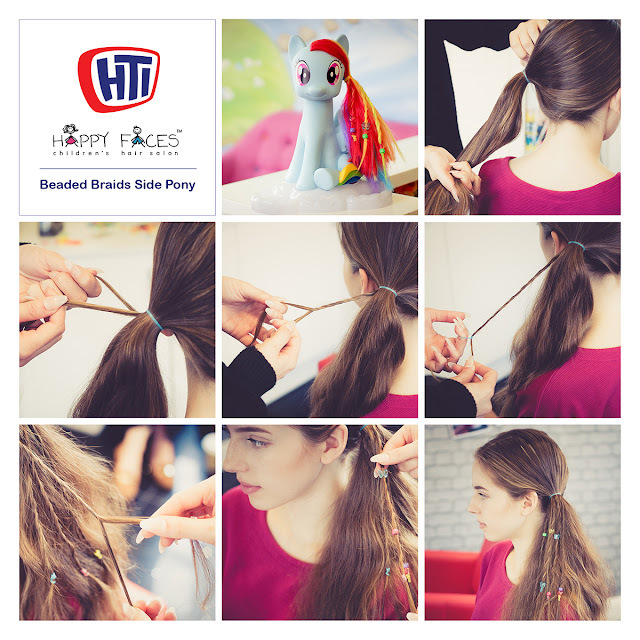 If you fancy recreating Lara's favourite My Little Pony hairstyle then I'd attached the step-by-step instructions below!